Here we have our Minnie Mouse Jack-O-Lantern shirt and trousers outfit. 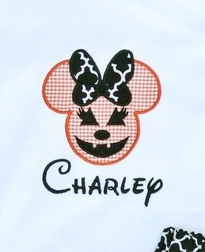 It turned out so cute with it's Minnie Mouse Jack-O-Lantern face with eyelashes! Minnie is made with orange gingham and has a black quatrefoil bow. The trousers are made of black quatrefoil and have orange gingham ruffles.